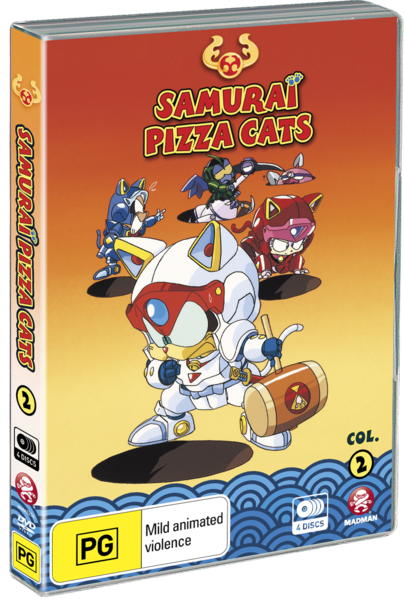 Samurai Pizza Cats Collection Two is an animated action comedy series about four cats named: Speedy Cerviche, Polly Esther, Guido Anchovy, and Francine who are in charge of running a pizza shop named "Samurai Pizza Cats". Life at Samurai Pizza Cats is very hectic as their shop is always full of out of control customers that want a quick bite to eat. Sure that might sound like a typical day job but the pizza place is only a cover for their real job. 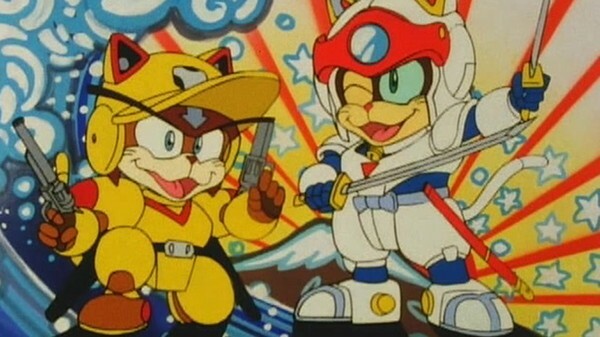 The Samurai Pizza Cats crew are actually a bunch of superheroes named "Samurai Pizza Cats" (some cover their shop is). They are appointed by their chief (named Big Al Dente) to protect the city of Little Tokyo from the evil harebrained schemes of a money hungry fox named "Big Cheese" and his sidekick "Jerry Atric" whom is crow. 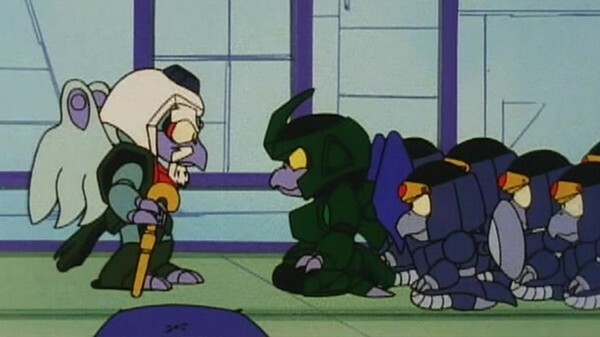 Jerry Atric is also the leader of a squadron of some tough birds (I'm being sarcastic) called the "Ninja Crows". The Samurai Pizza Cats can normally handle the bad guys but sometimes they get stuck in a pickle and need help from a back-up group called "The Rescue Team" that are made up of the following cats: General Catton (a huge sumo cat with great strength and huge cannons), Bat Cat (he glides through the air like a bat or a man who thinks he's a bat), Spritz T. Cat (master of everything that involves water), and Meowzma O'Tool (he can drill through anything with his drill paws). 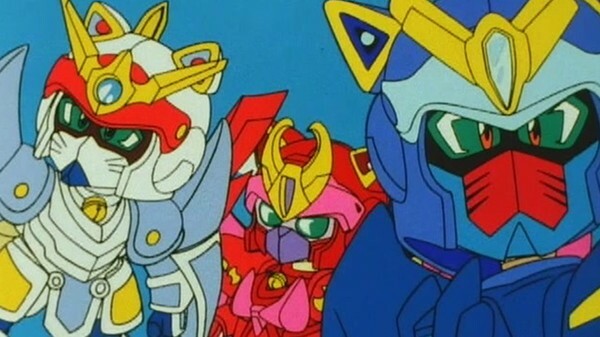 When that's not enough to stop the bad guys we have the Samurai Pizza Cats summon special robot suits that has some very powerful abilities (although I don't know why they just didn't do that right from the start). These cats are crazy. (Click "Read More" to read the full review). This show is mainly episodic but there are some mini-storylines that will go for two to three episodes. If you are into super series shows then leave the room as every episodes of this show are very insane and make no sense what so ever but instead of creating headaches it creates some brilliant fun instead. Some examples of how insane this show becomes includes: Speedy Cerviche raising a pig that comes from outer space that ends up with the pig trying to eat the entire planet Earth, Big Cheese traveling back in time trying to protect himself from the Samurai Pizza Cats who are trying to stop him from having his past self meeting with the Ninja Crows, and Speedy Cerviche teaming up with the Emperor after they get banished for messing up the princess' pizza order. I must admit that compared to the first volume this is tame but still insane nonetheless. Comedy in this show is very funny but it has aged as it is full of 80's/90's pop culture references that only a certain percentage of adults will get. There is more to the humor than that though but it is more of the general humor you would see in children's shows and it works pretty well in this show and it will also appeal to adults. Action in this show is really fun, very insane, and it also mixes in comedy that's pretty funny plus it doesn't take away from the seriousness of the fights. Characters in this show are such charming goofballs that you can't help but to find them adorable and you will really like them. I also like how their names are puns and am surprised that they can get away with referencing movies like "Fritz The Cat (1972)" but I am also glad as it gives us adults more to laugh at. I'm even more surprised that they allow guns in this show and I don't know many cartoons that left them in back in the day (and I remember even less modern day shows that have non-laser guns) but I like it and if you are worried about guns in this show, don't worry as it is done in a very safe way. Artwork in this show has a very nice bright and colorful look with some really great backgrounds that capture olden day Japan really well. Character designs are very cute but not so cute that you'll feel sick and they also have a nice charm to them with how they mix animal, human, and mechanical all into one. English dub in this show is purposely campy but it is extremely charming and done really well and adds to the characters and comedy of this show. I really enjoyed the music in this with it's very catchy soundtrack that sounds like a jingle straight out of a toy commercial... Plus a little hint of cheesiness that you would hear on a cruise ship. Overall this is a very fun show that both kids and adults will enjoy on different levels. Purrrfect viewing... I just wanted to find an excuse to use a pun like that but in all seriousness this is a very good show. I remember really liking this show as a kid but I only got to see about 3 episodes before it was taken off the air for one reason or another. Good article man!